The LANmark-5 Unscreened Snap-in connector is part of the Nexans modular system and ﬁts in all structural hardware designed for this range. As such it supports all data applications deﬁned for Cat5, and Cat5E, such as 10baseT, Fast Ethernet, Gigabit Ethernet, 155 ATM. 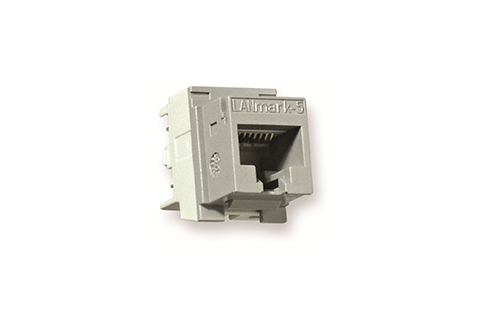 The LANmark-5 Unscreened Snap-in connector has been designed to reach the highest performance in Cat 5e and Class D. It has outstanding performance for attenuation (insertion loss), NEXT/FEXT, Power Sum NEXT/FEXT and Return Loss, exceeding the Cat 5e connector specs as in ISO/IEC 11801:2002. Used with Nexans LANmark-5 cables and patchcords, the connector is tested to exceed the link and stringent four-connector channel requirements as deﬁned in the ISO/IEC 11801:2002. The LANmark-5 Unscreened Snap-in connector is covered by the guarantee as in The General Terms and Conditions of Sales. In combination with the Nexans LANmark-5 product range, the Nexans Certiﬁed System Warranty can be obtained, covering parts, system and labour warranty. The LANmark-5 Snap-in connector makes termination easier and quicker thanks to exclusive design of the wire organizer. The connector is designed to be terminated by hand, without punchdown tool. For faster and easier installation, an optional universal comfort tool can be used (N420.567). This tool includes also the exclusive extraction mechanism which makes the connector re-usable. A stranded version is available for reliable termination in consolidation points of 3 or 4 connector channel models. The LANmark-5 snap-in range is Nexans technology inside and user friendly outside.